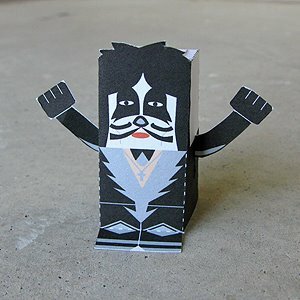 These paper toys are Peter Criss / Kiss, designed by Toy a Day. George Peter John Criscuola, better known as Peter Criss, is an American drummer and singer, best known as the original drummer for the rock band Kiss. Criss established the “Catman” character for his Kiss persona. In 2012 he was inducted into Modern Drummer’s Drum Hall Of Fame.